Everything’s going great and then one day, you find it – a wart. These bumps are growths of wart tissue caused by HPV, a virus extremely hard, if not impossible, to get rid of. It gets into your body through tiny breaks in the skin and is common in places like showers, locker rooms, and pool decks. But even though the virus itself is hard to get rid of, warts can be taken care of, no problem. You can go the medical procedure route, with surgical excision or cryotherapy, at-home kits like salicylic acid or a freezing agent, or you could go with a homeopathic solution. One natural way that people have found to kill warts is the black salve. What Is Black Salve And Is It Effective? 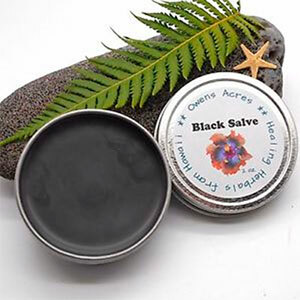 Black salve is composed of several ingredients with the main component being bloodroot, a flowering plant native to Eastern parts of North America. It’s not something that should be taken lightly, as the substance is produced, Sanguinarine, is toxic and can easily damage healthy tissue. 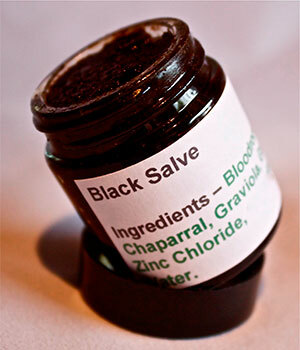 Because of how easily it kills fast-growing cells, the Black salve is used most often in skin cancer treatment. Sanguinarine: This is the toxic substance that the bloodroot plant produces. It’s considered escharotic, meaning that it easily kills living tissue. This makes it an excellent wart-fighter. Bloodroot is used for natural wart killing in the Amazon. Graviola: This plant, native to the warmest regions of South America, stimulates the immune system to kill viruses and invading cells like cancer. It is also caustic to living cells, which makes it a good option to apply externally to warts. Bitter Melon Seed: This fruit has been used for years in Chinese medicine for the use of cancer therapy. Its seeds have been shown to be effective at killing invading cells, like those of warts. Glycerine: Used as a lubricant, Glycerine isn’t meant to be a medicinal ingredient, but just makes the salve more smooth and easy to rub on. Nordihydroguaiaretic acid: An extract of the Creosote bush, this acid is a cell killer. Zinc Chloride: This substance is a powerful corrosive that destroys living cells. If you’re looking for something over the counter, salicylic acid will be the most readily available option. Coming in several different brands, you’ll brush it on your wart over the course of 2-4 weeks. One of these brands is Compound W. To learn more about Compound W wart remover, click here. It’s important that you don’t get black salve in your eyes or mouth. Because of its highly toxic and corrosive nature, it can cause damage to these sensitive areas that might be hard to correct, including the digestive tract. You have to be careful when using black salve. Because of its highly corrosive nature, it can easily destroy the skin surrounding your wart, which isn’t good and can result in scarring. Clean and dry your wart. Soak in warm water and file with a pumice stone or nail file to get rid of as much dead wart cells as possible before treatment. Using a cotton swab, rub the black salve on your wart and nothing else. Apply a bandage or first aid tape over it for protection and to keep the salve in place. Leave on for 24 hours, then wash and dry, and cover with Vaseline if desired. Repeat after a 24 hour break. Did you know that instead of using a band-aid or first aid tape, you can use wart pads? Made with adhesive on the back, these round pads will form a tight seal over the wart to keep medication close to your body and protect the site. To learn more about the benefits of these wart pads, go here. Plantar warts can be more stubborn than the common wart. They’re also tricky to deal with, considering their location. It can be uncomfortable to walk on a foot that has a bandage stuck to the underside of it. The constant pressure of walking can also displace the medication or bandage. Black salve may burn as it kills the wart tissue. A solution to this problem is to apply black salve at night before bed, leave on while sleeping, then wash and dry in the morning, and repeat at night. The side effects of using black salve can be harsher than using something simple like salicylic acid. Because of its powerful killing properties, black salve will most likely give you some kind of sensation such as burning or stinging, although most people say it’s tolerable and not harsh enough to make them quit using it. After an application or two, your wart will look different. Some people report their wart turning black and swollen, while others say their wart turned white and pus-like. Regardless, your body should make the wart naturally fall off within days to a week. Sometimes, a hole will be left in the skin that can look unsettling. But don’t worry, as your body will heal itself and build up new skin in its place. There are topical creams for warts and then there are ointments. Despite what some may think, these two products aren’t the same. An ointment may have some benefits that creams or gels may not. More details on wart ointment can be found here. Black salve may help to combat the actual HPV virus that’s causing the wart. Some of its ingredients are known to affect the immune system and might encourage your body to kill the virus off completely or harm it enough to prevent warts from coming back quickly. But remember, because of its nature, HPV will usually stay in your body, even if it’s dormant and not causing warts. When choosing a wart treatment, there are always things you need to think about. How fast does the method work? Whatever type of wart you’re dealing with, consider using black salve as treatment. Not only does it have a powerful effect on killing wart cells, but it’s also much cheaper than medical intervention and uses only natural ingredients. Who knows – it may just be the thing that kills your warts for good. You can find further details of Warts treatment here. More on my father: He’s a shirt-off builder with red beard and has but one small skin cancer on the right side of his face below temple. Once again glass is the possible cause as in Australia it’s the right side of the face exposed during driving/ sitting in traffic as he would have done on his way home from work. As a child he said all they had was coconut oil for sunscreen! Do your research and don’t deprive your children of the sun via UV30. Vitamin D – bone growth – happens during the earliest years, so let the sun build your child’s strong foundation.